So it’s officially spring time in the UK. It’s also Easter Sunday today and the sun’s been shining. I’ve just come back from sharing a lovely yoga masterclass with a wonderful group. Quite a few years ago, I used to plan a yoga routine for each month. The classes I taught had the month to get into the routine and have the time to allow the routine to get under their skin. It allowed them time to work their way around certain poses and to develop the feel of the class. At the start of each month, the class looked forward to starting another routine and for me as a teacher, it made it more efficient as I only needed to plan 12 routines for the year. For one reason or another, I stopped doing that and decided at the start of this month that I’d do that again, but this time, with a different theme for each month. So I started with “being brave”. Let me explain why I chose to work with a theme. Whilst undergoing my yoga teacher training many years ago, I struggled with applying what I loved about yoga philosophy to my yoga practice. How on earth did a philosophical point apply when I’m attempting bird pose, or full bound lotus? And, what about pranayama? How on earth did “being compassionate” relate to twiddling my nostrils? Then one day, I had a light-bulb a-ha moment. My yoga teacher said that how you address your problems on your yoga mat is how you deal with your problems in life and since then, I’ve always viewed yoga practice as a metaphor for life. Challenges are challenges, and it’s as simple as that. It’s the thought process through the challenge that is the key. It really doesn’t matter what the yoga pose is. It’s about how we confront the situation and that in itself is the lesson. So in being brave this last month, the question is how can we be brave when we’re practicing yoga. Do we move through our yoga practice on auto-pilot and within our comfort zone? Making changes to how we approach any situation can be done in the safe environment of a yoga practice. And if we can be brave within that environment, perhaps we can adopt the same mindset in life. Tomorrow sees the start of a new month and a new season. Spring brings with it new beginnings and a certain amount of freshness but in order to spring forwards we need to be brave, we need to stand strong. Nothing changes if nothing changes. As scary as the future can be, it can also be the beginning of new things. 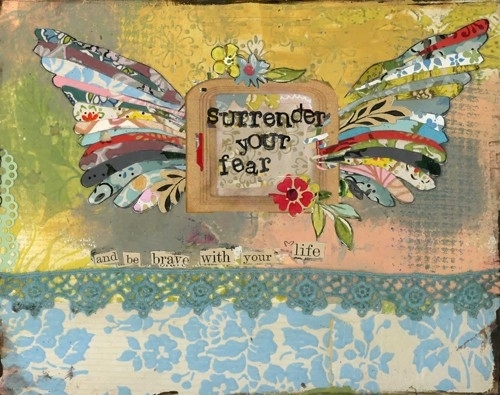 Whatever life is presenting to you right now, stand strong in your own self, take a deep breath and be brave.